There is a chance for an agreement between the new Greek government and euro-area partners with both sides claiming victory at home. In the days ahead of the Greek snap elections on 25 January 2015 a huge range of opinions has appeared on what Greece and its lenders should do. A large group of people are saying that Greek public debt is unsustainable and a significant part of it should be written off. In their view, the Troika is responsible for the deep crisis, austerity has failed, and the fiscal space gained from the debt write-off should be used to stimulate growth. Another group says that irresponsible pre-crisis Greek policies, as well as the extremely large, 15% of GDP budget deficit in 2009, necessitated the bail-out in 2010. Implementation of the bail-out conditionality was incomplete and the Geek public sector is so inefficient and so much depends on cronyism that it is not surprising that the Greek crisis became so deep. As always, both sides have some truths but none of these explanations is complete. One could write a lot on what happened, who is responsible for desperate social hardship and what should have been done differently. But after the elections, both Greece’s new leaders and euro-area partners should look ahead: given the status quo, what are the real choices? Exit is not an option. Greece would enter another deep recession, which would push unemployment up further and reduce budget revenues, requiring another round of harsh fiscal consolidation: exactly what opposition parties want to avoid. (This effect is forgotten by those who argue that since Greece has a primary budget surplus, it has now the option to default and exit.) Euro-area creditors would lose a lot on their Greek claims and private claims on Greece would also suffer (see our earlier post here). Moreover, exit would also risk the stopping of EU-budget related inflows to Greece (cohesion and structural funds, agricultural subsidies): in 2013 Greece received a net payment of 2.9 % of GDP from the EU budget. This was a transfer (not a loan) and the country would receive similar transfers in the future too. Debt write-down is extremely unlikely – and unnecessary as well. Any level of debt is sustainable if it has a very low interest rate. Japan is a prime example: gross public debt is almost 250 % of GDP, while the average interest rate is 0.9 percent per year. Despite the very high Japanese public debt, there is no talk about its restructuring. Loans from euro-area partners to Greece carry super-low interest rates and also have very long maturities. The lending rate from the European Financial Stability Facility (EFSF) is a mere 1 basis point over the average borrowing cost of the EFSF, which is around 0.2 percent per year currently. The average maturity of EFSF loans is over 30 years with the last loan expiring in 2054. Moreover, in 2012 the Eurogroup agreed on a deferral of interest payments of Greece on EFSF loans by 10 years, implying zero cash-flow interest cost on EFSF loans during this period. The interest rate charged on bilateral loans from euro-area partners is Euribor plus 50 basis points, which is currently about 0.56 % per year: another very low value (which could be lowered further, as we argued here). Bilateral loans have a long maturity too: they should be gradually repaid between 2020-2041. One can say that yields will not remain so low forever and if ever growth and inflation will pick up in the euro area, interest rates will increase. Unfortunately, this is in the distant future and therefore the cash-flow gain for Greece from stopping interest payments to euro-area partners would be very low in the next few years. In fact, according my calculations, one of the demands of Syriza leader Alexis Tsipras will be likely met this year, even without any change in bail-out terms: actual interest service costs of Greece will likely be below 2% of GDP in 2015. Table 1 shows the situation in 2014. Total interest expenditures of Greece amounted to 4.3 % of GDP. 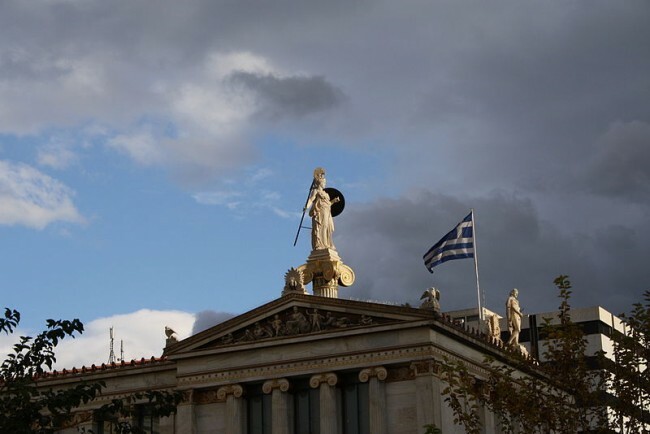 However, interest paid to the ECB and euro-area national central banks (NCBs) is returned to Greece (if Greece meets the conditions of the bail-out programme) and interest payments on EFSF loans are deferred. If we subtract these, interest payments were only 2.6% of GDP in 2014, well below the values of other periphery countries. Given that interest rates have fallen significantly from 2014, actual interest expenditures of Greece will be likely below 2% of GDP in 2015, if Greece will meet the conditions of the bail-out programme. Since the actual debt servicing cost of Greece is low, it is extremely unlikely that parliaments and governments of euro-area lending countries would decide to cancel their Greek loans and raise taxes at home to cover the losses. Maturity extension and further cut in interest rate: yes. While euro-area loans to Greece already have extremely long maturities, further extension is possible. Whether the average maturity is 30 years or 40 years, there is not a big difference. Moreover, the 50 basis point spread over Euribor, which is charged on bilateral loans, can be abolished without leading to direct losses to euro-area partners. As was argued with Pia Hüttl, such changes would imply a 17 % of GDP net present value gain for Greece over the next 35 years. While this would not be an upfront funds that could be spent, on average the primary surplus of Greece could be about 0.5 % of GDP lower in the next 35 years, which is sizeable. A new financial assistance programme: yes. As we argued with André Sapir and Guntram Wolff a year ago, a third programme should be put in place to take Greece out of the market until 2030. Even if the currently very high market interest rates for Greece will fall, they will likely remain too high. Easing fiscal policy: perhaps. In our paper with Sapir and Wolff we also argued that the new programme should be accompanied by enhanced budgetary commitments by Greece, whereby Greece should reach a balanced budget by 2018. Hoverer, due to the fall in interest rate and an improvement in economic activities (2014 was the first year with modest economic growth, with 2-3 percent growth expected for 2015), in November last year the Commission forecast a balanced budget already for 2015, despite a forecast decline in structural primary surplus (Figure 1). 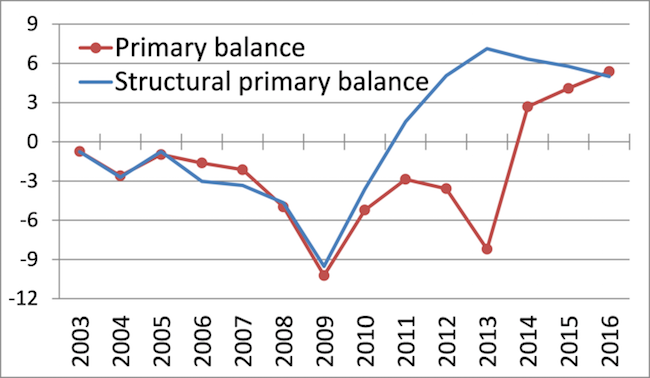 In fact, the expected decline in the structural primary surplus would imply fiscal easing and therefore the expected improvement of the actual primary balance (red line of the figure) is expected to come mainly from the improved economic situation. If the maturities of euro-area loans to Greece are lengthened and the 50 basis points spread on bilateral loans is scrapped, the primary surplus could be reduced by an additional half percent of GDP. Therefore, there would be some room for manoeuvre to ease the social pain and to help growth with some public investment. Structural reforms: yes. Even Syriza argues that Greece needs major structural reforms. Yet it may be difficult to find an agreement between Greece and the Troika, because many of the current plans of the Greek opposition parties are in diametric opposition to reforms agreed under the financial assistance programme. But a compromise has to be found: both sides have strong incentives to agree and structural reforms have to be part of the comprehensive agreement. A European boost to economic growth in the euro-area periphery: should be yes, but low hopes. With Sapir and Wolff we also argued for the need for European support to growth throughout the euro-periphery. While I continue to think that there would be a strong rationale for it, unfortunately I see little political reality. European assurance for Greece against adverse shocks: yes. Even if Greece will cooperate with euro-area partners and will fulfil its commitments, such a high debt ratio is sensitive to adverse risks, like weaker growth, lower inflation or higher interest rates. Therefore, some sort of European assurance is needed for Greece to eliminate the uncertainty over Greek debt, if Greece meets loan conditions. Otherwise, the uncertainty may deter the investment climate, even if euro-area loans have super-long maturity and low interest rates. One option would be to index official loans to Greek GDP as I suggested in a 2012 paper. Thereby, if the economy deteriorates further, there will not be a need for new arrangements, but if growth is better than expected, official creditors will also benefit. Another option would be to commit on the part of lenders to reduce loan charges below their borrowing costs, should public debt levels prove unsustainable despite Greece meeting the loan conditions (as we argued with Sapir and Wolff). What are the chances for such a comprehensive agreement which could be claimed as victory by both sides? I think it is higher than many commentators think, for two main reasons. First, lack of an agreement may lead to Grexit, which would be so bad for all that both the new Greek leadership and euro-area partners have very strong incentives to avoid it. Second, there are some reasonable options to agree on the reduction of the debt burden and easing fiscal policy, as I outlined above. Thereby, the new Greek leadership could claim that it achieved a major reduction in the cost of debt service and got some fiscal space to ease the social pain and boost growth, while European partners could tell their people that they only extended the loan maturities and eliminated the gap between their own borrowing costs and their lending rate to Greece, thereby taxpayers should not suffer loss. Certainly, negotiations may not work out nicely. We do not know yet if a government will be formed right after the elections, or a new election will be needed later; Greece may run out of time. When a government is formed, negotiations could be suspended, perhaps repeatedly, which would create further uncertainty. Such uncertainty would lead to deposit withdrawal from Greek banks and deteriorating economic and fiscal outlook. Some euro-area partners may say no to certain parts of the agreement even if other euro-area partners agree. Some members of the new Greek parliament may say no even if the new government and most of its parliamentary members are in support. I may have also incorrectly assumed that the responsible decision makers think rationally. Therefore, there could be many pitfalls for an agreement, yet the Grexit threat will be hanging over the negotiators like the sword of Damocles. Zsolt Darvas is a Visiting Fellow at Bruegel since September 2008 who continued his work as a Research Fellow from January 2009, before being appointed Senior Fellow on September 2013. He is also Research Fellow at the Institute of Economics of the Hungarian Academy of Sciences and Associate Professor at the Corvinus University of Budapest. A version of this post appeared in ISPI Dossier.